Ariana Detrez is a freelance graphic designer with a background in art education. 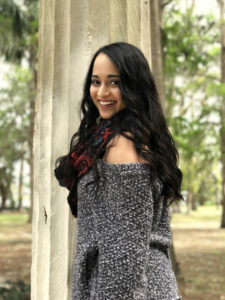 She received her bachelor’s in art education from the University of Central Florida. She taught high school art 2-D and digital photography for a year until she realized she wanted to get back to her creative roots. She has always been drawn to the arts, and graphic design allows her to tap into her creativity while helping businesses. Ariana is constantly branching out in her design work, testing out trends, and exploring her skills. When Ariana is not expressing her artistic perspective through design, she is exploring other creative fields such as photography, drawing, and paper-crafting. Ariana is new to military life and being a military spouse; however, she is enjoying the refreshing change. It has been quite an adjustment, but a positive one nonetheless. Learning about the Air Force and the military, along with participating in the community, has really helped her grow and connect with others.